Mrs. Miner's Kindergarten Monkey Business: Differentiation in Kindergarten? A Freebie to Show You It Can Be Done! 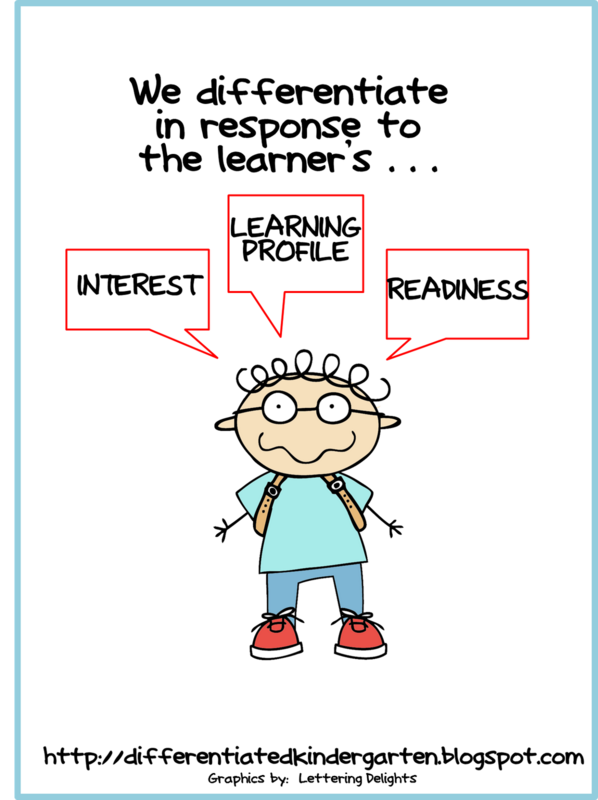 Differentiation in Kindergarten? A Freebie to Show You It Can Be Done! Please join me in welcoming Marsha McGuire from A Differentiated Kindergarten. Enjoy her great post while I am in South Carolina enjoying the beautiful rays and my wonderful family! Hello everyone, my name is Marsha McGuire, from A Differentiated Kindergarten, and I am so delighted to have the opportunity to sit in Krissy's seat today as a guest blogger. It's a bit surreal (and ok, nerve wracking) to be writing for a blog you've been stalking, but I'm up to the challenge and so thankful that she has given me the opportunity to meet all her great followers, talk a little about tiering and offer you this write the room addition activity here and only here for FREE. My blog is a mixture of ideas and activities to use in your classroom with a little fun thrown in to liven things up, I also have a special interest in Differentiated Instruction. The one thing that I constantly hear from student-teachers and teachers who haven't quite caught on to differentiating their instruction, is 'it's soooooo overwhelming" or "I can't quite get my head wrapped around it" For those teachers I like to suggest starting out with only tackling one thing and build up. 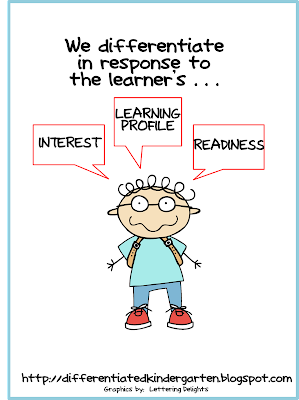 Remember, you can differentiate by responding to a students interests, learning profile or readiness. So, to start with your might want to tackle tiering one activity, just to get your feet wet. 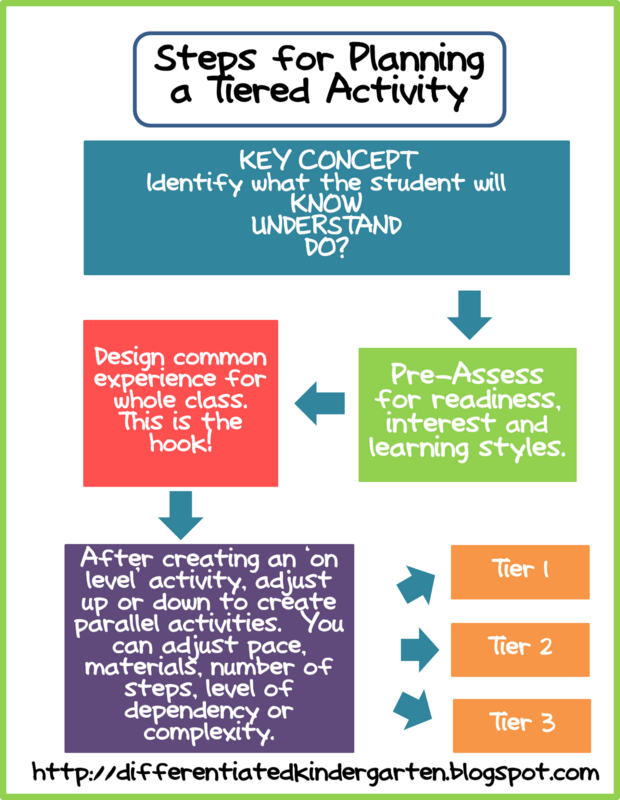 While I don't suggest using a flowchart for everything you tier, I do think it will be helpful, especially to us visual learners, in giving you an idea of what it might look like to tier and how to go about thinking about tiering an activity. First identify your key concept . . . this is your common core, standard or whatever skill or concept is ESSENTIAL for them to master. Then create your whole group experience or lesson. I like to make this fun and interactive so that I get them HOOKED and interested. And finally, you're ready to create your activity. This is where you adjust the pace, steps or complexity based on your students and place them in the corresponding tiers. Ok so here's how it would work in an example of a real kindergarten lesson. Now mind you, I don't fill out a paper like this for every activity, but I do consider the steps. Let's say I'm introducing (or in this case continuing my instruction of addition) to my kindergarten students.﻿ The flow chart might look like this. Are you having your A-HA moment now? See, it's really not that difficult, but absolutely necessary. Sure I could just have all my students work on addition 1-10 since that is where most of them are performing, but here is what I know: Those students who find the activity too difficult will soon get frustrated and shut down, and those students that find the material too easy will get bored. Either way, it's a recipe for acting out and bad behavior. Yikes. Keep them engaged, feeling successful but challenged and your behavior problems are few and far between. So to get you started, I created an addition activity that is already tiered and ready to go for you. It's a 'write the room' activity so not only is it differentiated by addressing your students' level of readiness, but it is also differentiated by learning style. Your kinesthetic learners will LOVE you for it. And besides, I don't know a kindergartener that doesn't LOVE to use a clipboard. So get 'em out for your little kinder honeys to use and get 'em roaming around the room. All you have to do is download it, laminate it, cut it out and put it to use. 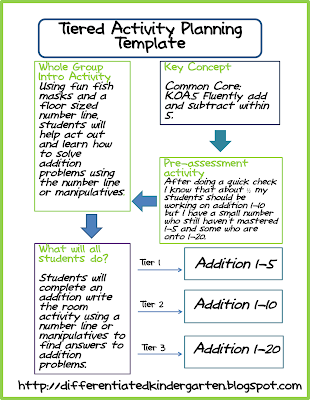 When I use this activity, I place it in one of my math stations and separate the tiers by colored poly envelopes. Each student knows what color they are so they just grab that envelope. 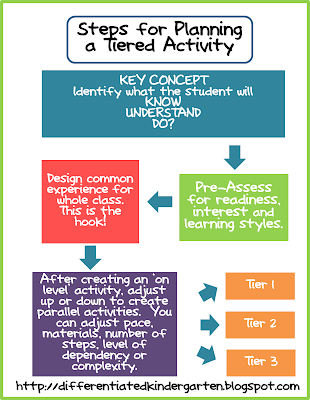 The activity is equally interesting for all students regardless of what tier they are utilizing. There are two sets of cards, so you actually can extend their learning and just switch out the cards for them to use the activity several times if you like. 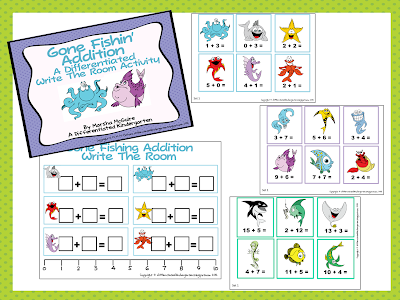 I hope you like it and will consider stopping on over to my blog to follow me for other freebies, activities and ideas on differentiating instruction in your classroom. Just click on my name to find me. It has been great fun sitting in for the infamous Mrs. Miner. Thanks so much Krissy.